The book begins with witness to The Bone Field murders, Hugh Manning, fleeing in fear for his life. Detectives Ray Mason and Dan Watts are tasked with bringing him in before the killers discover his whereabouts and execute him gangland-style. First of all I must state that I haven't read the first book in this series, The Bone Field. Whilst it would have been helpful to establish characters who appear in both, I didn't feel it was a necessity. Enough information is given in The Hanged Man for the reader to have a good grasp of what has gone before. The book is very cleverly written with many a twist and turn. Detectives Mason and Watts are flawed individuals working on the fringes of the law. Ray Mason's temper often gets the better of him and Dan Watts has a penchant for meaningless one-night-stands since his marriage breakdown. Yes, the book is gritty and violent - not to everyone's tastes - but I thought it no more so than modern-day tv crime dramas. In fact I could see this book and it's predecessor being serialized for television. It was action-packed and fast-paced from start to finish. I thought events were nicely tied-up at the end; yet with an opening for continuation should the author so wish. I received an Advance Reader Copy of this book. 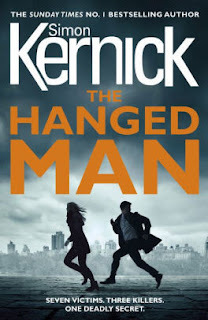 My thanks to Simon Kernick, NetGalley and the publisher. A house deep in the countryside where the remains of seven unidentified women have just been discovered. A cop ready to risk everything in the hunt for their killers. A man who has seen the murders and is now on the run in fear of his life. So begins the race to track down this witness before the killers do.